Are you looking for a delicious rum cake recipe? Then I have got just the one you are looking for. This decadent gluten-free rum cake is an absolute all time favorite of everyone. It looks stunning and tastes divine with the delicious coconut butter rum glaze on the top. This cake is an absolute crowd favorite for any holiday celebration or even on any casual dinner parties. This makes a tasty and beautiful dessert. A cake is an effortless dessert that you can never fail to impress the crowd with. Make it a centerpiece at any family event or dinner party and the guests will never fail to praise you and shower you with compliments. However, many people these days are very cautious about gluten in their diet and usually tend to avoid the intake of gluten. Many are there who are completely intolerant to this food category. Therefore, this cake recipe has been made gluten-free and appropriate for all your guests who are intolerant to gluten and tend to avoid it. This cake is an absolute winner of hearts. And not just on holidays, it is a delicacy that you can make for any dinner party. 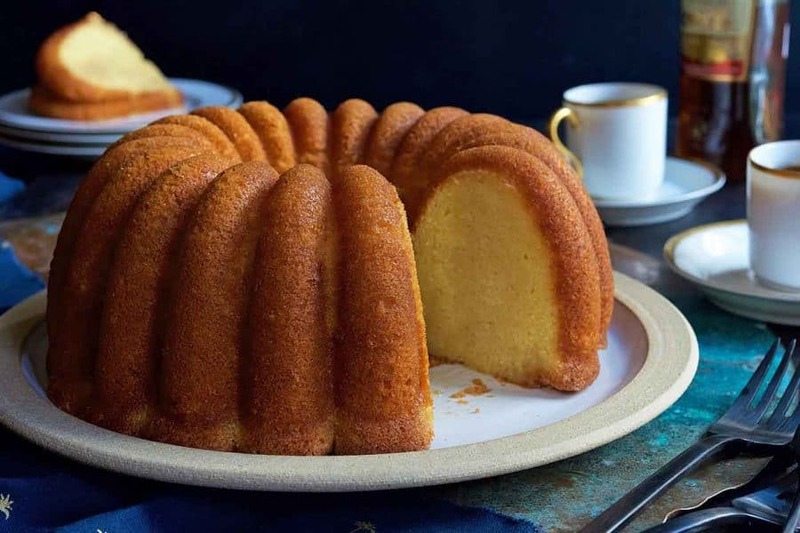 The amazing part of this cake is that not only does this tastes absolutely divine but it looks spectacular baked in the mesmerizing bundt shape and with the decadent glaze on top. And the best part is that you can make it easily at your home with only a few simple ingredients. Let’s have a look. Take a large saucepan and add in 3 tablespoons of maple syrup, followed by butter, coconut butter, and rum and let the mixture simmer together for 5 minutes. Once the mixture is boiled and simmered to the right rich and thick consistency set the glaze aside to cool down and it is all ready to be poured on the top of the cake once prepared. Take a large stainless saucepan to make the caramel that you will have to incorporate in the cake mix. In your saucepan, add the coconut oil, butter, sugar and 1/4 of the rum and mix well. Simmer the mixture together and add the rest of the ¾ cup of rum and vanilla extract. Let the mixture cook for 10 minutes straight in medium flame and stir well. Once done, let it sit aside and cool. First and foremost, preheat the oven to 325 degrees F. Take a ten-inch bundt pan and slather it with grease and flour and set aside. Take a large bowl and add on the almond flour, coconut flour, salt, baking soda and give the mixture a good mix. Once you have mixed all the dry ingredients together it is time to add the rest of the ingredients. Add eggs, caramel sauce that we had already prepared earlier and maple syrup and mix everything together. Put the batter into the greased bundt and bake it in the preheated oven for 45 minutes till baked completely. Once it cools down drizzle the coconut rum glaze on top of the decadent moist rum cake with is absolutely gluten-free. This gorgeous and decadent caramel gluten-free rum cake is the best that you will have ever tasted and you can make the entire thing at your home with these few simple steps. Serve this delicious rum cake to your guests to any family get together or dinner party or in any celebration and be ready to get praised as this gluten-free rum cake is sure going to win everyone’s heart. All your guests will be surely coming up for a second slice so make sure you make plenty for all.